Johnson's California Territories of New Mexico Arizona Colorado Nevada and Utah. One of the scarcest and most historically significant of A. J. Johnson's southwest series. 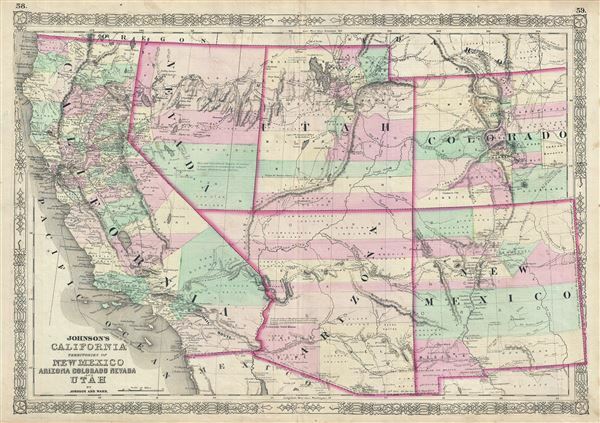 Published in 1863 at the height of the American Civil War, this stunning map depicts the state of California and the territories of Nevada, Utah, Colorado, New Mexico and Arizona. Offers superb detail throughout noting mining districts, emigrant trails, the Santa Fe Trail, the Pony Express Route and several proposed railroads, as well as American Indian tribes, geological features, and local political divisions. This important map went through several different states during its publication period from 1861 to 1870. This critical period of westward expansion saw incredible development and change throughout the region. Collecting the various states of this map has become something of a sub-genre for south-western map aficionados. Johnson updated the plates for this map annually and sometimes even issued multiple variants the course of a single year. Unlike most maps in the 1863 Johnson atlas, this map was a unique production and therefore not based upon the earlier atlas maps of J. H. Colton. Rather, it seems that Johnson derived this map by dissecting the plates of his 1859 wall map of North America and then incorporating, oftentimes superimposing, more contemporary detail. Johnson added considerable detail in the mountainous regions of California, Nevada, and Colorado. Arizona and New Mexico appear as independent territories but, for the most part, adhere to the old 'New Mexico' county structure. The southern boundary of Nevada with Arizona is set at 37 degrees of Latitude such that Las Vegas, which is noted, rests firmly within Arizona. The Utah-Nevada Border is set at 115 degrees of Longitude, roughly one degree further west than it is today. Fillmore City is shows as the capital of Utah though Salt Lake City also appears. The Colorado Gold Region, which was first discovered in 1858, is well labeled. This example also varies from the previous state of the map in that the California – Nevada border has been corrected to a straight line between Pyramid Peak (where several Mormon settlements are noted) and Fort Moliare. California, which enjoyed a population boost in the prior decade due to the 1849 Gold Rush, is naturally quite detailed with numerous towns, cities, mail routes, emigrant roads, and shipping lanes identified. This map also includes the routes of several exploratory missions commissioned by the U.S. Government, including Fremont, the Mexican Border Survey, Parke, Gunnison (along with the site of his tragic death), and Fredonyer. Throughout, this map is full of interesting and sometimes erroneous notations regarding natural features, Native American tribes, proposed railroads, mail routes, explorer's tracks, and treaty lines. In the highly desertous region near modern day Quartzite, Arizona, a note reads 'in the vicinity of this place a tract of country is found which is said by Trappers to be exceedingly and fertile and abundantly timbered and well watered.' Johnson also notes silver deposits in this same region. The famed Pony express Route is delineated as it passes through Nebraska, Utah, and Nevada on its way to California. All in all, this is an extraordinarily example of one of the scarcest and most desirable 19th century American atlas maps of the southwestern part of the United States. Features the fretwork style border common to Johnson's atlas work from 1863 to 1869. Published by Johnson and Ward as plate nos. 58-59 in the scarce 1863 edition of Johnson's Family Atlas. This is the second edition of the Johnson atlas to bear the Johnson and Ward imprint. Rumsey 0352.044 (1864 edition). University of Nevada, Reno, Special Collections, G4300 1862 J646. Wheat, C. I., Mapping of the Transmississippi West, 1540-1861 (5 vols), #1027.